The vanity in your bathroom will typically house your plumbing and sink. such as towels, cleaning supplies, tissues and various other items you might need. High quality vanities can also serve as the focal point in your bathroom, so it is a good idea to consider the theme, decor and space in your bathroom when choosing a one. In the Toronto area there are many companies that offer a variety of vanities, but none can outperform the quality and expertise you’ll find with Stone Masters. We offer an excellent selection of bathroom vanities at competitive prices and we can customize the shape, colour and style to your specific project. layout, you may not require too much additional storage and that is perfectly okay, because we have everything from medicine cabinets to pedestals and accompanying mirrors from one to three panels. We also offer vanity package deals with sinks and countertops made of the finest Italian marble and Travertine in shades from Bianco to Rosato and everything in between. The sinks can be raised bowls or inlaid, it is entirely up to you and when you contact our award winning customer service representatives with your questions we will be more than happy to offer any advice or suggestions that can help you in your search. As mentioned above, the vanity tends to be a major point of interest for guests visiting your bathroom, so you want to make a point of using it to tie the room together. We at Stone Masters understand that not everyone at home is an interior decorator, so for that reason we have trained staff that can discuss your bathroom measurements and decor in order to help you achieve your desired effect and layout. At Stone Masters we are committed to bringing the highest quality furnishings to our customers and that includes strong wood bases for our vanities that are finished with rich, deep hues and marble or travertine countertops that can match your other furniture and colour scheme flawlessly. We consider the Toronto market our home, but we ship all over the world and with each customer we expect to earn your business time and time again, so please do not hesitate to contact us to discuss your project or check out what new surfaces our international buyers may have unearthed that can be used with your vanity. At Stone Masters, you will find deals on high-quality bathroom vanities in Toronto and surrounding areas. The vanity is an important accessory for any bathroom. It’s made to house the sink and plumbing. It must have an attractive appearance that matches the walls, countertops, bathtub, and every other part of the room. We offer a wide range of vanities in every style, colour, and size imaginable. You can order a base vanity unit by itself, or as part of a package deal with sinks and countertops made of Italian marble and travertine. One important consideration is size. You don’t want your vanity to be too large or too small for your bathroom. Choices include small pedestal vanities, corner style units, single and double-sink vanities, etc. Models are available with shelves or drawers; some come with both. We also offer mirrors to fit the panel(s). The vanity you go with should match the countertop and mirror. If you want to order the vanity by itself, separate from the top, make sure you get the right style. For a small bathroom, you might want to go with a single pedestal vanity or medicine cabinet. For a large bathroom, a double-sink unit might be ideal. Another thing to consider is how much storage space you need. If you share the bathroom with anybody else, you’re probably going to need more than a shelf or a drawer. You’ll need enough room for towels, toiletries for everyone, makeup, shower and bath items, hair dryer, and so forth. If you don’t have a lot of room, we can help you come up with a custom vanity and storage solution that will work for your bathroom needs. Bathroom vanity colours and finishes range from traditional, muted tones and finishes to bold, modern approaches that will make a unique style statement in your bathroom. Here, you will find vanities available in one of four wood finishes: Mahogany, Oak, Cherry, and Maple. The product selection includes Kas, Moderna, Nikko models, Solo models, and more. There are 9 base bathroom models to choose from, and each can be customized as much as you need it to be. Whether you want to bring the warmth of natural wood to the bathroom, or would prefer a dark, bold wood, we offer a vanity to suit any design scheme. 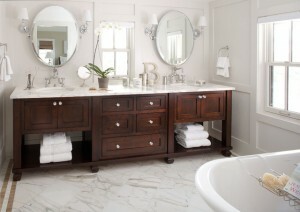 Imagine having a dark cherry vanity with a Carrara marble countertop, or an oak cabinet with a travertine top. These styles – and more – are available right here at StoneMasters.ca. No vanity is complete without a mirror, and we offer mirrors to match each and every unit, no matter how you customize it. It’s recommended that you order the mirrors that we offer as they are designed specifically to match our vanity panels. In our catalog, you will also find a variety of travertine sinks. Our knowledgeable staff will help you decide on the best vanity solution for your bathroom. Fill out the free quote form or call us now if you have any questions. All of our bathroom vanity products are inspected by experts prior to departure to ensure that everything is of the highest quality possible.